Dum Paneer Kali Mirch recipe is n unique dish with the use of Kali mirch to make it spicy as well as tasty. Find this unique yet yummy recipe at The Masala Route. 1. Heat oil in a pan and add the cardamoms, cloves and cinnamon. 2. Now, add onion paste and stir it well. 3. Add ginger garlic and green chili paste. Saute it properly. 4. Add yogurt and cook for few minutes. Then add turmeric powder, coriander powder, pepper powder, salt cumin powder and red chili. 5. 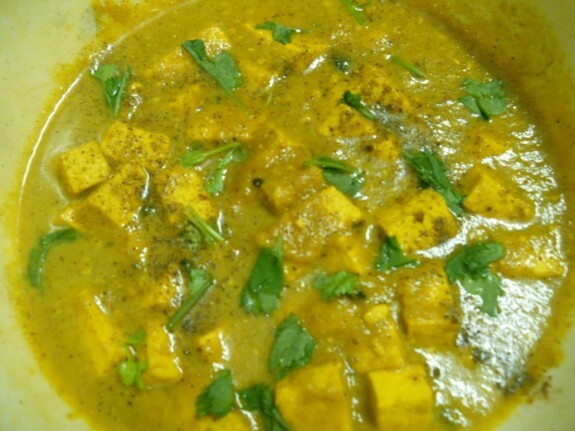 Add paneer cubes stir it and then add ½ cup warm water. Add fresh cream too. 6. Put a lid and cover it. Cook it in low flame for 10-15 mins. 7. Now remove the cover and cook it further if you want thick gravy. 8. Remove from heat and garnish it with coriander and mint leaves.